A slightly late blog post from Mr Loadlink as I have been catching up with all sorts after the festive period! Another month, another trade show to meet potential and existing clients, suppliers and demostrate our #load cells all of which are in our #loadcell hire stock. 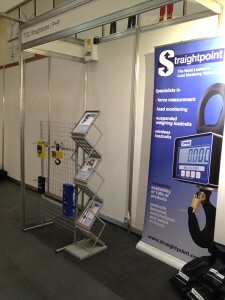 This week I am at the Executive Hire Show Exhibition 2012. The executive hire show is the premier event for top decision makers in the hire industry and according to the organisers the 6600 metres of available exhibition space is sold out, meaning there will be more products on show than ever before! The event takes place on Wednesday 8th and Thursday 9th February 2012 at the Ricoh Arena in Coventry. Come and say hello to us at stand TT22 where members of the Straightpoint (UK) team will be demonstrating our range of load cell products. Here is a quick round up of the exciting happenings in January! The Portsmouth Business awards are organised by the Portsmouth News and are an annual celebration of the successes, innovations and growth of great local businesses in the Portsmouth area. This year Straightpoint have been entered into the category of ‘Exporter of the year’ and we are delighted to have been selected as a finalist for the second year running (must get the suit at the ready). The gala awards presentation evening will take place at the Guildhall Portsmouth on February 10. If we win I will be sure to let you know! Wish us luck! I am pleased to announce that Straightpoint have re-branded with an improved identity. The former Straightpoint logo has been around for over 30 years. Though traditional and established the management team here at Straightpoint have been looking to refresh the logo to something a little more 21st Century. I worked with IGDesigns to have a few designs mocked up (several months and designs later…) here is the final version which we are all delighted with! You can expect to see this on all marketing material from 2012 onwards. Do let us know your thoughts?